Edna Mae was one of those women. I think we have known each other a little over thirty years. I am not sure how it started, but I think it started when Ed Buchart and his mother, Celanaire, introduced her and Helen Morehead to me at the Cathedral when I was pastor there. Masses led to dinners – hundreds of dinners with her, Helen, Edward, Tom and myself! Birthday dinners! Christmas dinners! Easter dinners! Dinners just for the hell out it! We consumed large amounts of wonderful food over the last thirty years. There are a lot of things “special” about Edna Mae, but one in particular. We are related! She was descended from one Breckinridge County Mattingly brother and my mother from another. We were what you might call “kissin’ cousins.” That gave me a right to kiss her on the forehead the other day, about 20 minutes before she died. When I heard that Edna Mae had died, I immediately thought of two Scripture readings. We read them both. The first one was from the Book of Proverbs. It is a description of the ideal Jewish wife of ancient history: strong, industrious, creative and eternally faithful in her role as mother and wife. She made her husband and children proud and the community had a deep respect for her and her husband. I remembered another widow, an eighty-four year old woman named Anna from the gospel reading, who liked to hang out in the temple in Jerusalem at the time of Jesus. Anna and Edna Mae have a lot in common. Anna was a widow. She had known sorrow, but she never grew bitter. Sorrow can do two things to us. It can make us hard, bitter, resentful, and rebellious against God. It can make us lose faith or it can make our faith grow deeper. It all depends on how we think of God. If we believe that God is mean, we will resent him. If we know God as a friend, we grow even closer to him. 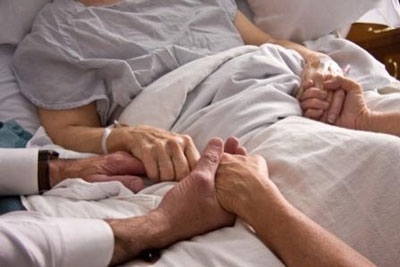 Like Anna, Edna Mae loved and trusted God, even in her losses. Anna, of the gospel reading, was eighty-four years old. Even though she was widowed early in her marriage, she never gave up. She pushed herself, she got out of the house and she went where she could mix with people and make new friends. Age can take away the strength of our bodies, but age can do worse. It can take away the spark in our hearts and make us grimly resigned to a life of despair. Edna Mae, like Anna, never gave up. She stayed connected to life, to her friends, to her family and to her church as long as she could. Anna, in the gospel readings, never ceased to worship and pray. It says “she never left the temple” and “day and night she worshipped with prayer and fasting.” No minimal “Sundays and holy days of obligation” for Anna. She had an intimate relationship with her God and enjoyed living in his presence. Like Anna, Edna Mae and God were close, daily companions and friends. Like most Catholics her age, Edna Mae was faithful to her religious upbringing even when she was not able to get to church any more. Family and friends, we are not here to mourn the end of Edna Mae’s life. We are here to celebrate her entry into eternal life. Edna Mae lived long and well. There was nothing more here for her to do. She squeezed all she could out of this life and prepared herself for the next. What else can we do, but celebrate with her and thank the God who created this faithful and committed woman, sustained her for so many years and now calls her to his side? Emory, Billy, Edna Mae and Mary Ellen, I want to thank you for sharing your mother with the rest of us! Be proud of yourselves for the love and care you showered on her! I thank Edna Mae, as well, for her faithful friendship over the last 30 plus years! Edna Mae, may you and your dear husband, Emory; you and your parents, William and Edna; you and your many friends and relatives who have gone before you, rest in eternal peace. WHO SAID "YOU CAN'T GO HOME AGAIN?" I'VE BEEN INVITED BACK TO HELP OUT! My dear friend, Patricia Kirchdorfer, lives at the Episcopal Church Home. We laugh a lot, gossip some and pray a little. I am pushing her to use her iPad. It intimidates her a bit, but I believe she can learn it in time. 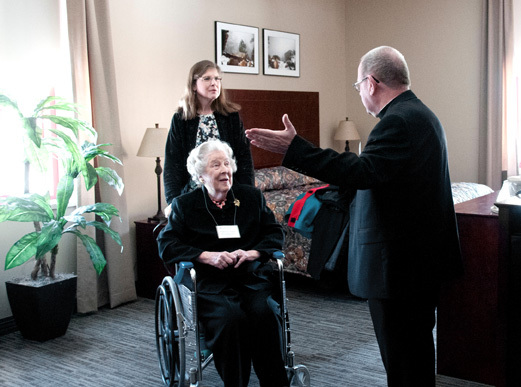 Here she is at the dedication of the space she renovated in honor of her father, Paul Tafel, on the third floor of Saint Meinrad's Bede Hall. It is part of the INSTITUTE FOR PRIESTS AND PRESBYTERATES that I founded when I was employed there. The space especially houses program for training retired priests who want to learn new skills for ministry. It is called the St. Simeon Residences. Mrs. Kirchdorfer is escorted by her daughter, Anne Locke. Here Patricia is again (flowered blouse) at a dinner in honor of Bishop Gordon of Barbados at Volare's. Jack, as a young man, around 1968. Jack Anderson and I go back to about 1964. He was very helpful and supportive when I was a struggling seminarian at St. Meinrad --- and ever since. To honor him, I had the coffee shop I founded at St. Meinrad named after him at his 80th birthday . It's called "JACK'S IN THE COMMONS." 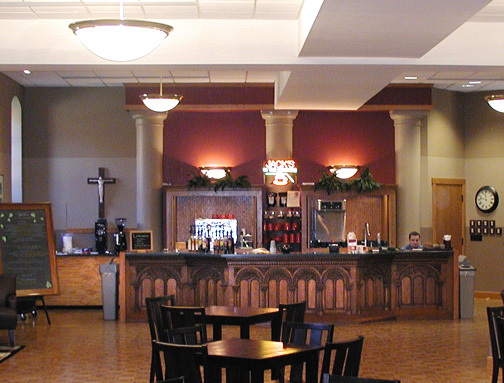 It is a full service coffee shop, ice cream parlor and gathering place for seminarians, monks, staff and visitors. Jack lives at Nazareth Home and that is a "visitor dog" belonging to Chef Dean Corbett, a mutual friend. This is a good shot of the bar end of the coffee shop with the JACK'S neon sign on, which tells people it is open for business. I retired recently from St. Meinrad Seminary, after ten years of running the continuing education division called the Institute for Priests and Presbyterates, of which I was the founder. It was really a “leadership training program” for priests and bishops. One of the most important things I learned about “leadership” I learned back in my thirties, long before I started that leadership training program at St. Meinrad, back when I first came to Louisville to be pastor of the Cathedral of the Assumption. Until that assignment, I had been a home missionary and the pastor of a small country parish in the center of the state. I was not prepared to lead a large city parish, much less the archdiocesan cathedral. I had to play it by ear and learn on the job. When I arrived at the cathedral, I was given an even younger associate pastor. When we would go to staff meetings, I would come with an empty yellow pad and he would come with hand-outs. As a result of his preparation and my lack of it, we reached a collision point. I was the “designated leader” and he was the “real leader.” I had the title and he had the power. Something had to be done. I had to either kill him or step up to the plate and become a leader, not only in name, but also in fact! I learned very quickly that a title means very little unless there is some ability to go with it! This was the situation in the gospel we just read. The scribes and Pharisees had the designated titles of leadership, but Jesus with no titles at all, was becoming the real leader. The people were amazed that a person without any religious credentials was such an effective religious leader. Like my own situation, it was destined to come to a collision point. Unlike my own situation where I stepped up to the plate, rather than eliminating my competitor, the Scribes and Pharisees had Jesus condemned to death. Instead of pulling themselves up to Jesus’ level of spiritual leadership, they pull him down and had him put to death. This was also the situation that poor Jeanne Jugan faced in her life. She was poor, uneducated and powerless, but she showed the world that the power of simplicity and poverty can sometimes be more powerful than the power that "people in power”hold. With basically nothing but faith and determination, she founded a community of sisters now serving the elderly in 31 countries. She suffered the indignity of having the leadership of her beloved community seized by a priest who decided that he would replace her as leader and send her into retirement without any say in the decision. Even when others saw this as an injustice, Jeanne simply accepted it as the will of God and took the lowly obscure job of begging for the community. 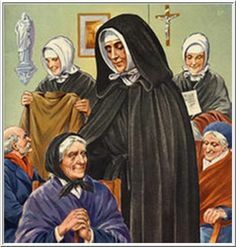 The Holy See later removed the priest, but by the time she died 27 years later, few of he young Little Sisters even knew she was the foundress. Father Le Pailleur might have grabbed her title, but Jeanne Jugan really kept her power. She became a saint, but he didn’t. That’s true power! FINALLY, THE TV RECOGNITION I DESERVE? "They've finally named a beauty product after me, who would have thought?"